The most complete history of Carrickfergus online. Carrickfergus – also known as ‘Carrick‘ – is a large town in County Antrim, Northern Ireland. It is located 11 miles north-east of the Northern Irish capital of Belfast, and has a population of some 27,000+ people. It is located within the Mid and East Antrim Borough Council area – which was formed in 2015 from the merging of Carrickfergus, Larne and Ballymena borough councils – and is part of the Belfast Metropolitan Area, or “Greater Belfast”. The town is twinned with the US cities of Portsmouth NH, Jackson MI, Anderson SC and Danville KY, as well as the Polish city of Ruda Śląska. It is the oldest town in County Antrim and one of the oldest in Northern Ireland. The area which is now Carrickfergus, or more specifically the rock that the castle sits upon, was supposed to have originally been known as Dunsobarky (translates roughly as “strong rock” – Dun signifying an insulated rock and Sobarky meaning “powerful” or “strong”). It is worth noting that the application of this name to Carrickfergus was quite possibly an error by 18th century historian Charles O’Conor in his map of Ireland, when it was supposed to be applied to Dunseverick (Dún Sobhairce), a hamlet on the north coast. Carrick claims roots back to the late 5th and early 6th centuries CE, and its alleged namesake King Fergus Mór mac Eirc, an Irish king of Dál Riata. Legend dictates that Fergus left Ulster around this time to forge a kingdom in Scotland. He is said to have returned to Ulster in search of an ancient healing well to cure his leprosy – this well could be the one which still exists underneath the castle keep or, more likely, St Brigit’s (St Bride’s) Well which is located north of the town centre. The well was quite familiar to pilgrims and may be connected to monastic activity in the area during the 10th and 11th centuries, about which very little is known. During a heavy storm, Fergus’s ship was said to have been wrecked on a volcanic dyke by the lough shore, which became loosely known as “Carraig Fhearghais” – the Rock of Fergus – providing the area with a new name. The king’s body is said to have washed ashore and been buried somewhere in nearby Monkstown by the monks. Although Carrick’s own lore and even recent Council-funded tourist information signage reflects this myth almost as fact, there is no evidence that such an event occurred. The Council signage outside the castle today even goes so far as to pin-point the exact date to 531 CE – a claim that we must cast considerable doubt on. As above, it is widely (if not unanimously) accepted that the name Carrickfergus comes from the legend of Fergus and his ill-fated voyage. However, J Bell wrote in A Conjecture as to the Origin of the Name of Carrickfergus that the name is more likely to have come from the Irish Carraig na Fairge, meaning “Rock of the Sea”. He did unfortunately come to this conclusion through mistaking Fergus Mór mac Eirc with the fictional King Fergus I, and so dismissed the accepted story. His point on the Irish name however is a valid one, and he points out similar historical names all the way down in County Clare in the Republic of Ireland, such as Fortfergus, the River Fergus and Knockfergus (from the Irish Cnoc na Fairge, meaning “hill of the sea” or “rock of the sea”). 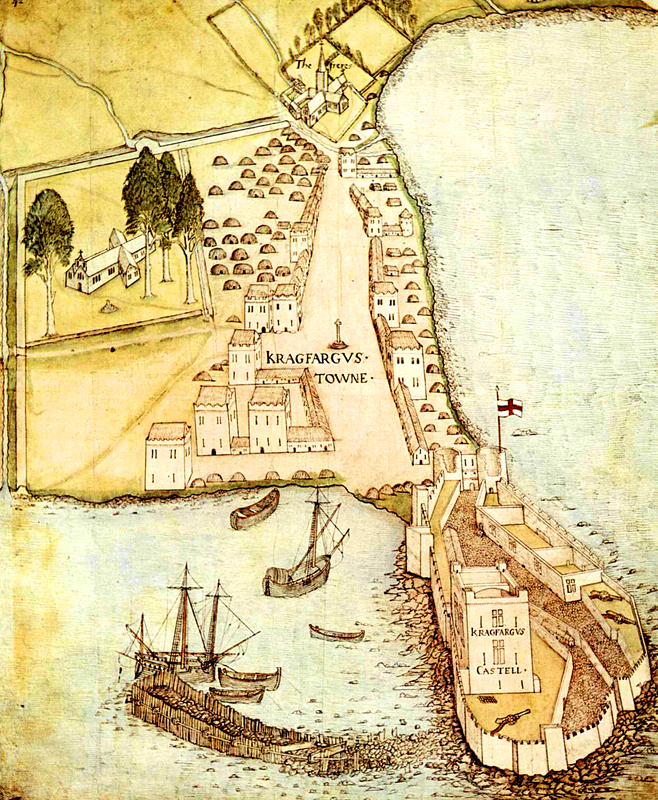 Carrick itself was known as Knockfergus during the Elizabethan era. This is more than likely the true origin of the name “Carrickfergus”. The town was first referred to as “Cragfergus” or “Carrigfergus” by the time written works and maps began to be produced, and later “Kairrigfergus”, “Kragfergus”, “Kragfargus” or “Carraigfergus”, although the Irish-derived “Carraigfergus” has now taken prominence. The two former spellings are most likely of Welsh origin, a result of the amount of English knights and soldiers of Welsh descent, mostly archers travelling with John de Courcy’s army, who came to Ireland at around this time under the authority of King Henry II, and inspired the naming of conquered lands under the Welsh language. During the reign of Elizabeth I, the town was normally referred to as “Cragfergus” or “Knockfergus”. Carrickfergus far predates the Northern Irish capital of Belfast. It was in existence hundreds of years before the future capital city, was larger and more strategically and economically important than Belfast, and even comprised its own county. Belfast Lough itself was known as “Carrickfergus Bay” until well into the 17th century, after which Belfast overtook the town as the prominent power and regional capital. As a historical walled town, Carrickfergus originally occupied an area of approximately 100,000 square metres, which now comprises the bulk of the town centre. The wall is still standing in most places, and in various states of preservation – the best example of which is the North-East Bastion at Joymount. Not much is known about the area that would become Carrickfergus prior to the Anglo-Norman invasion of Ireland. There are multiple sites in the area where evidence of prehistoric settlements have been uncovered, most notably at Lough Mourne just north of the present-day town. Here, a number of crannogs were uncovered during draining of the lough in 1881, as well as several ancient structures and a wooden canoe – all though to be late-Neolithic in origin. Monastic activity is sparsely documented in the area, although mostly further afield in the Monkstown area. Kilroot, just east of Carrickfergus is frequently noted as having been founded as a monastic and ecclesiastical site in around 412CE, although we believe this date to be closer to 500CE based on the available evidence. Kilroot is thought to have operated with both a bishop and abbot during the Early Christian period, before being amalgamated into the diocese of Connor some time before the year 1100. It is possibly the oldest documented settlement in the area. Carrick’s history as an inhabited town began during the Norman invasion of Ulster in around 1177, when Anglo-Norman knight John de Courcy arrived in the area after invading Ulster with his army, in an attempt to gain his own Earldom. In January 1177, and without King Henry II’s permission, he marched north from Dublin with 22 knights and 300 foot-soldiers and horsemen, launching a surprise attack on Dún Dá Leathghlas (now called Downpatrick) and moving on until reaching Coleraine. He went on to conquer most of eastern Ulster, which was controlled by the ancient Irish kings, in the following months before finally settling in the area now known as Carrickfergus. His progress was swift, due to the far superior weaponry used by the Norman soldiers. He established his headquarters in Carrick and had begun construction of Carrickfergus Castle on top of the ‘rock of Fergus’ by the beginning of 1178, using stone ferried across Carrickfergus Bay from Cultra – this fine stonework can still be observed in the corners of the Great Keep. The establishment of St Nicholas’ Church followed in around 1182.
de Courcy is also credited with the founding of the St Mary’s Premonstratensian Abbey in Woodburn (Woodburne Abbey), to which the parish of St Nicholas was granted. St Nicholas’ own website queries whether the church was granted to the Woodburn Abbey of the White Canons or the later Friary of the Franciscan monks located in the town proper. Despite St Nicholas’ own doubts, it is clear that the church was affiliated with Woodburn. Sir Hugh de Lacy was commanded to do what he might to apprehend and take Sir John de Courcy, and so devised and conferred with certain of Sir John’s own men, how this might be done; and they said it were not possible to take him, since he lived ever in his armour, unless it were a Good Friday and they told that his custom was that on that day he would wear no shield, harness nor weapon, but would be in the church, kneeling at his prayers, after he had gone about the church five times bare-footed. And so they came at him upon the sudden, and he had no shift to make but with the cross pole, and defended him until it was broken and slew thirteen of them before he was taken. 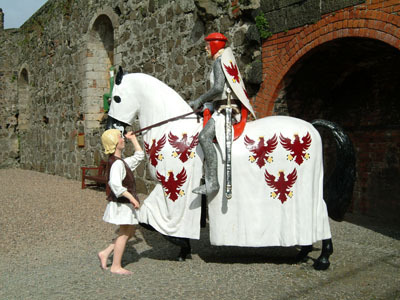 In May 1205, following de Courcy’s expulsion, King John created de Lacy the 1st Earl of Ulster, and Carrickfergus became the seat of the Earldom. The banner of Hugh de Lacy is displayed above the entrance to the castle. de Courcy returned in July 1205 with a force of Norse soldiers and ships on loan from his brother-in-law Rögnvaldr Guðrøðarson, King of Mann. They landed at Strangford and proceeded to besiege Dundrum Castle, which de Courcy himself had built. Ironically, de Courcy’s siege failed, as the defences that he himself had built were simply too strong. He was captured and imprisoned in the Tower of London on the orders of King John, and his lands and titles were revoked. A legend exists that de Courcy, after having been imprisoned for some time, begrudgingly accepted King John’s request for him to act as his champion in a tourney against a champion of Philip Augustus, King of France. After the French champion fled rather than face the former knight, de Courcy in a show of strength cleft a metal helmet in half with his sword, embedding the sword so deep in the wood beneath it that only he alone could remove it. The legend is disputed by many, but there is a significant amount of reliable references that at least partially authenticate the story. Most historical accounts show that lived most of the rest of his life incarcerated and in poverty, before being released after swearing to dedicate the remainder of his years to a personal pilgrimage to the Holy Land. de Courcy allegedly died in obscurity near Craigavon in around 1219. His armour is still displayed in the Tower of London. de Lacy was relieved of command in 1210, when King John himself arrived and placed the castle under royal authority after a 9 day siege. John is thought to be the only English or British monarch to have stayed at the castle for any notable length of time, staying in the castle for ten days in July 1210. Under John’s authority, the castle was further fortified by adding an exterior curtain wall – creating the middle ward of the castle – on the landward side, a task overseen by one of John’s appointed constables De Serlane. de Lacy crusaded in France for some years after his expulsion, but returned in 1224 and attempted to siege Carrickfergus unsuccessfully. He eventually regained his Earldom in 1227, despite his attack on the town, when King Henry III allowed him to return. He founded the Franciscan Friary in 1232, which stood where the modern Town Hall and Carrickfergus Library now stand. He also oversaw the final construction of the castle, including the outer ward, gatehouse and gate towers. de Lacy married Emmeline de Riddlesford in around 1242 and died childless sometime after the 26th of December 1242 according to most accounts, leaving the Earldom of Ulster to become extinct and revert to the crown. His remains were eventually interred at the Friary in 1443 – it unknown whether his remains were moved when the friary was demolished. The huge extensions and additions to the castle, which de Lacy began, were finally completed in 1250. On the 26th of May 1315 Edward Bruce, the younger brother of King of Scotland Robert the Bruce, landed over 6000 men just north of Larne. Ireland had not had a High King since Ruaidhrí Ua Conchobhair was deposed at the beginning of the Norman Invasion. Edward, who boasted a lengthy royal Irish ancestry, sought to become High King of Ireland with the intention that Ireland could be used as a second front in the ongoing war with the English, expelling the Anglo-Normans from Ireland in the process. Bruce’s forces moved down the coast, fighting the forces of the Earl of Ulster, before capturing and burning Carrickfergus. They were however unable to take the castle, and so began a lengthy and bitter siege. Shortly afterwards in the town, King of Tír Eóghain, Domhnall mac Briain Ó Néill met up with the Scots and swore fealty to Bruce and proclaimed him High King, however this proclamation was largely ignored by the more powerful Kings of Ireland. Bruce left Carrickfergus in late June, leaving behind a considerable force to continue the siege. An attempt to replenish supplies from the sea by Sir Thomas de Mandeville in Easter 1316, resulted in his defeat and death. It was reported in the Laud Annals that of 30 Scots taken hostage during a parlay, 8 were killed and eaten, as the castle’s inhabitants became desperate for food. The castle surrendered in September 1316. Bruce was defeated and killed by the forces of Sir John de Bermingham in 1318, after which the castle and town came back under the control of the crown (and at this point King Edward II). On the 6th of June 1333 the 3rd Earl of Ulster William de Burgh was murdered, leaving only his infant daughter as heir, effectively collapsing the Earldom. All subsequent Earls would remain absent from the town and rule from afar, but the castle remained both under the control of the crown and the principle administrative centre in the north of Ireland. With the weakening of the Earldom the Clandeboye O’Neill clan, the ruling dynasty in most of western Ulster, took the opportunity to push eastwards from Lough Neagh until the English-controlled county of Carrickfergus was reduced to an area of around 5 square miles. 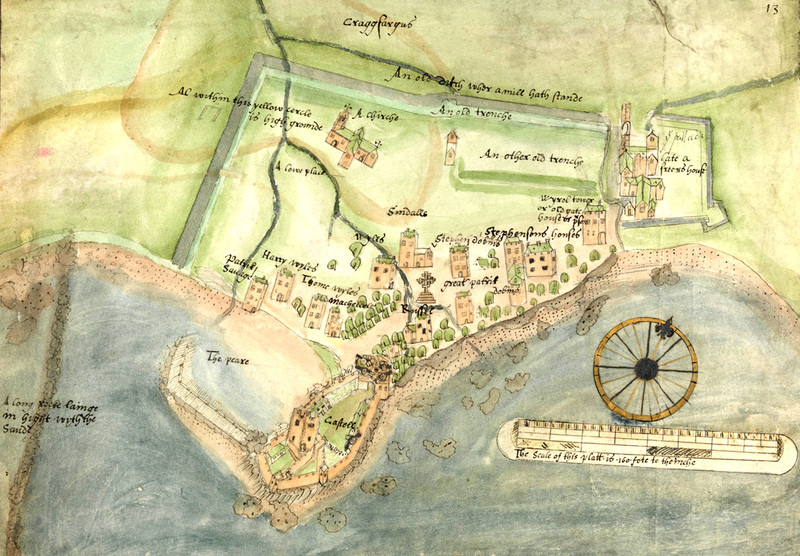 Niall O’Neill burned Carrickfergus to the ground in 1384. After the O’Neills arrived in Carrickfergus, William de Burgh’s family seized his land, joined with the Irish and assumed Irish names and identities. By this time the Highland Scots were settling in the northern parts of Antrim and, much like the Irish, were expanding into Anglo-Norman lands. 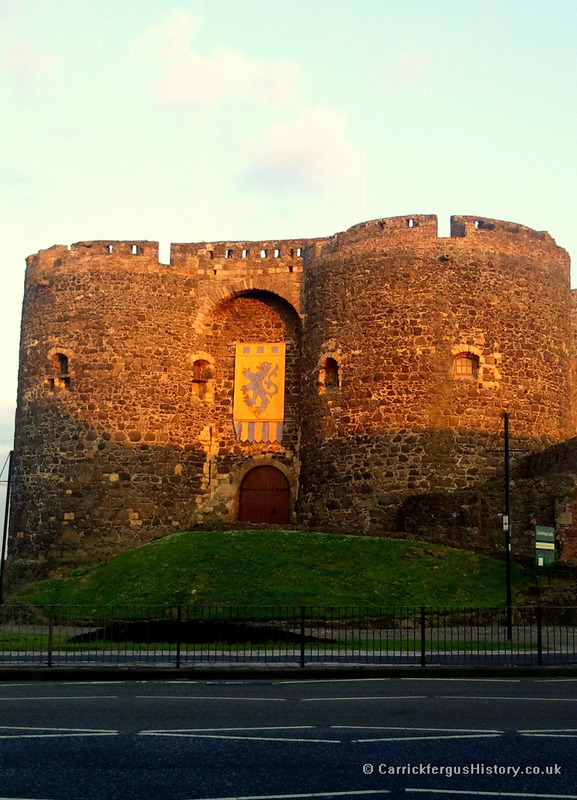 Carrickfergus was raided and burned by the Scots in 1386 and again in 1402. Although by 1400 most of eastern Ulster was firmly under the control of the O’Neills, a mutually advantageous arrangement existed between the crown and the Irish clans to keep the town and county of Carrickfergus under the effective control of the English. The English paid a “black rent” to the O’Neills, and as a result the town continued to be used as the primary sea-port in Ulster and a centre for huge amounts of local and international sea trade. This continued at least for the first part of the 1400s. The Earldom of Ulster was detached from Ireland and merged into the crown in 1461 with the accession of Edward IV to the throne of England. The town was put to the torch several more times in the following 150 years. In 1513 the Earl of Arran burned the town against the instructions of his king and in 1555 the Scots sieged the castle and burned the town once again. In 1573 the town was set ablaze again, this time by the Irish. The castle was repaired and renovated in the mid 1500s, most notably to adapt the walls for cannon. It was at this time being used as a base for expeditions against the Scots for much of the mid to late 1500s. All copyright material is credited where possible. Please contact us regarding any concerns. Any original content re-used or re-distributed from this website must be clearly credited to CarrickfergusHistory.co.uk. This website is hosted by Carrickfergus-based Big Wet Fish Hosting.